* Lysozyme exits in our bodily fluids to protect us from airborne bacteria. H2Ocean products are enriched with over 60 trace elements and minerals from the richest coral reefs of the ocean along with natural antibacterial enzymes which kill bacteria & help protect healthy living cells. Purified Ocean Salt Water is the only aftercare product that is natural to your body. Natural Healing & Cleansing Solution H2Ocean safely removes dried discharge and lymph secretion when used every 2-3 hours. H2Ocean increases circulation to the body or mouth piercing and accelerates the healing process. It will also help reduce lumps and scars. This formula remains sterile in our state of the art can. 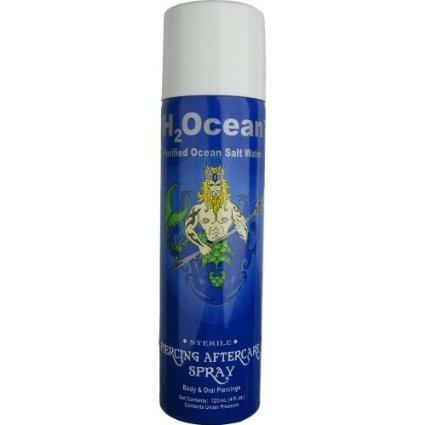 H2Ocean non-aerosol dry mist sprayer is ozone friendly and the can itself is recyclable. It is vital when taking care of a piercing to make sure that bacteria isn't introduced to the affected area, The only way to do this is by using a sterile formula like H2Ocean. H2Ocean.